The American Museum of Natural History will no longer host a gala intended to honor controversial Brazilian President Jair Bolsonaro, whose plans to open the Amazon rainforest to industry were seen by many as incompatible with the museum's mission, Reuters reported Monday. Violence in the Brazilian countryside is on the rise. In the last two weeks, Amazonia has seen an alarming increase in targeted killings, with three massacres and at least nine deaths. The Catholic Church's Pastoral Land Commission (CPT) defines a massacre as a killing involving three or more people. The Jirau dam cuts across the Madeira River in western Brazil. Its construction, like that of the Belo Monte dam, the Tucuruí dam, and other large Amazon dams, resulted in an upsurge in rural property values, leading to rampant land speculation, exploited by land grabbers, often leading to violence. Tropical forests globally are being lost at a rate of 61,000 square miles a year. And despite conservation efforts, the global rate of loss is accelerating. In 2016 it reached a 15-year high, with 114,000 square miles cleared. At the same time, many countries are pledging to restore large swaths of forests. The Bonn Challenge, a global initiative launched in 2011, calls for national commitments to restore 580,000 square miles of the world's deforested and degraded land by 2020. In 2014 the New York Declaration on Forests increased this goal to 1.35 million square miles, an area about twice the size of Alaska, by 2030. 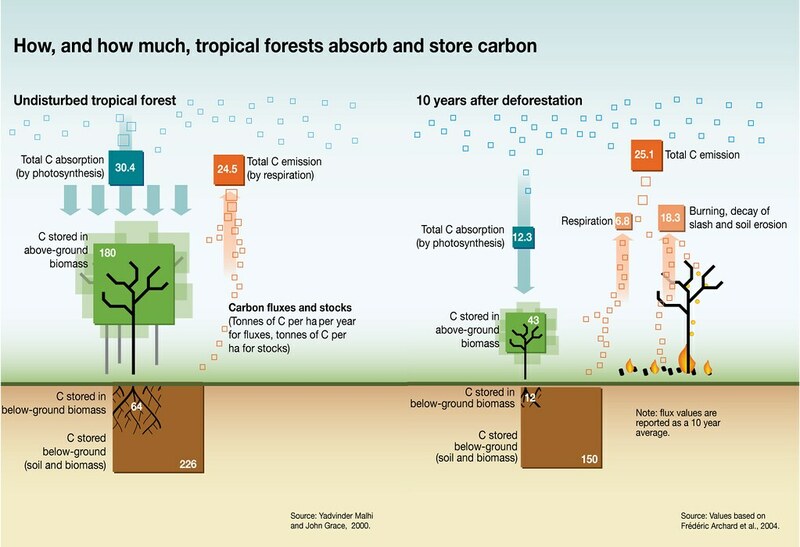 Logging and degradation of tropical forests is the main reason why forestry and land use account for 10–15 percent of the world's total human-induced CO2 emissions. Restored, but for How Long? "Don't expect us to continue buying European products," Malaysia's former plantations minister Mah Siew Keong told reporters in January last year. His comments came just after he had accused the EU of "practising a form of crop apartheid." A few months later Luhut Pandjaitan, an Indonesian government minister close to President Joko 'Jokowi' Widodo, warned his country would retaliate if it was "cornered" by the EU. For many years, international and Brazilian mining companies have dreamed of getting access to the mineral wealth lying beneath indigenous lands. And finally, the government of Jair Bolsonaro seems determined to give them that opportunity. On March 4, while Brazilians were distracted by Carnival celebrations, the new Minister of Mines and Energy Admiral Bento Albuquerque announced plans to permit mining on indigenous land. An industrial mining operation in Brazil. Note the forest at the edge of the open pit mine. Mining industry and individual prospecting requests on indigenous land as filed with the federal government. The mining industry has not only made prospecting requests (red) within indigenous reserves (yellow), but also on other conserved lands (green). Federal Deputy Leonardo Quintao, a major backer of the mining industry. Forest and topsoil must first be removed before ore can be accessed at Brazil's Norsk Hydro ASA Paragominas open pit mine. Such industrial processes would be highly destructive of Brazil's forests, indigenous reserves and cultures. In the U.S., we consume more than 15 billion pounds of tissue each year—more than 50 pounds per person. It's taking a major toll on forests like the Canadian boreal. Eucalyptus plantations in southern India that were abandoned and left to recover for nearly 40 years are still far from resembling the primary forest surrounding them, a new study has found. This, researchers say, suggests that once disturbed for long, forests may never bounce back to their original forms. In India, eucalyptus has often been the tree of choice when it comes to restoring degraded forests: it grows quickly, is hardy, and requires little care. But can these plantations, when left alone and allowed to regenerate, grow into the forests they replaced? Over the past 25 years that I have been conducting environmental research in the Amazon, I have witnessed the the ongoing destruction of the world's biggest rainforest. Twenty percent of it has been deforested by now—an area larger than Texas. I therefore grew hopeful when environmental policies began to take effect at the turn of the millennium, and the rate of deforestation dropped from nearly 11,000 square miles per year to less than 2,000 over the decade following 2004. In 2019, atmospheric carbon dioxide levels will make one of their highest leaps in the past 62 years of measurement, the UK's Met Office predicted Friday. This is because the tropical Pacific ocean is expected to be warmer this year, which leads to hotter and drier conditions that make it more difficult for plants to grow and absorb the excess carbon dioxide released from the burning of fossil fuels, which is fueling climate change. In his first major international speech, Brazil's new president Jair Bolsonaro told the politicians and business leaders gathered in Davos this week that he's opening up his country and its natural resources to foreign investment, all while—somehow—preserving the nation's environment and biodiversity. "It is now our mission to make progress in harmonizing environmental preservation and biodiversity on the one hand, with much-needed economic development, while bearing in mind that these are interdependent, inseparable pillars of our society," he said Tuesday at the World Economic Forum's annual meeting.